The modern reputation of Nicholas Ludford (c1490-1557) was really sealed by the first recordings of The Cardinall’s Musick in the early 1990s (ASV Gaudeamus, 7/93, 12/93, 7/94, 1/95). 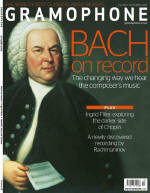 These pioneering discs transformed Ludford from being considered a bridge – linking Robert Fayrfax with John Taverner – to one of the most prolific composers of Masses in Tudor England and a great pre-Reformation musician. Having been largely the preserve of specialist vocal consorts it’s great to hear Ludford sung by the choir of Westminster Abbey, and this album joins another notable recent release by Trinity Boys Choir (Rondeau, 12/17) to perform his music in a choral setting. The opening Ninefold Kyrie, with nimble organ versets from old and new sources, showcases the smooth sound of the Lay Vicars, who comprise some of our leading consort singers. They forge a richly sonorous sound in the generous acoustic of All Hallows, Gospel Oak, and the organ (recorded in St Mary Undercroft, Westminster) offers a sprightly contrast. O’Donnell treads a conservative path through the richly textured Missa Videte miraculum. In the Gloria the Lay Vicars create a luscious, serene opening which the treble voices later expand into a full sixpart texture. 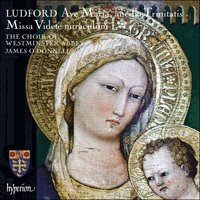 The sound is wonderful, yet I notice they never fully capitalise on Ludford’s ecstatic cascades of imitative writing, notably at ‘Gratias agimus tibi’. There is a sense of some slight, almost statuesque withholding. Overall I find the treble sound more rounded than the Choir of New College’s Missa Benedicta (K617, 8/08); and although I have a lasting fondness for the metallic feistiness of Higginbottom’s choir, I do find that O’Donnell encourages really graceful long‑arced phrases from his trebles and maintains an overall more consistent tone. The finest singing on this disc, however, is undoubtedly Ave Maria, ancilla Trinitatis: an exceptional work and a superb performance. The choir are heard at their finest in the more impassioned moments, of which this votive antiphon offers many.